After selling Grappa, he landed at The Palm Atlanta, the oldest family-owned steakhouse in the country. The Atlanta institution has been around since 1926. That's where Danny met his wife Monica. Soon after, Danny began running operations for The Palm and traveling frequently to locations across the country. When the Cosenzis became parents, they moved to Michigan to be near Monica’s family. Danny began running a farm-to-table concept dubbed Toasted Oak Grill & Market. During his tenure there, the restaurant was selected do a James Beard dinner in New York. “All the food we did was from Michigan. We wanted to stay true to the region. We even did Michigan wines,” he says. Michigan was quite a change after spending 16 years in Atlanta, and Danny and Monica were itching to get back to the South. The Cosenzis and their friends (turned business partners) frequented 30A, a beach road along Florida’s Emerald Coast, through the major stages of life: engagements, weddings, and parenthood. So, when Danny began looking for a restaurant to buy in South Walton, Florida, he knew he wanted to create a place where the staff felt like family. So how did he become a restaurateur with two concepts on opposite ends of the spectrum? On one hand is Restaurant Paradis, the sophisticated sister in Rosemary Beach. And on the other is the approachable bearded cousin known as Back Beach Barbecue. What could possibly be the tie that binds them? In a word: family. “We’re a bit of a dysfunctional family that still supports one another,” Danny jokes. Good Grit: How did you come to own Restaurant Paradis? GG: How did you collaborate on the concept for Back Beach Barbecue? “My running joke is, ‘I love barbecue forever.’ I was always sitting with the idea. “I took my chef, Mark Eichin, down to Austin, and in two days we did like eight barbecue places. A couple of people knew we were coming and took us right to the back. So we were in the pits back there with these guys. We 100 percent copied Texas Barbecue. All they do is put the seasoning on the meat—black pepper, kosher salt, some savory and other seasonings. They leave it exactly the way it should be and serve one person at a time. So you’re eating fresh meat cut right in front of you. 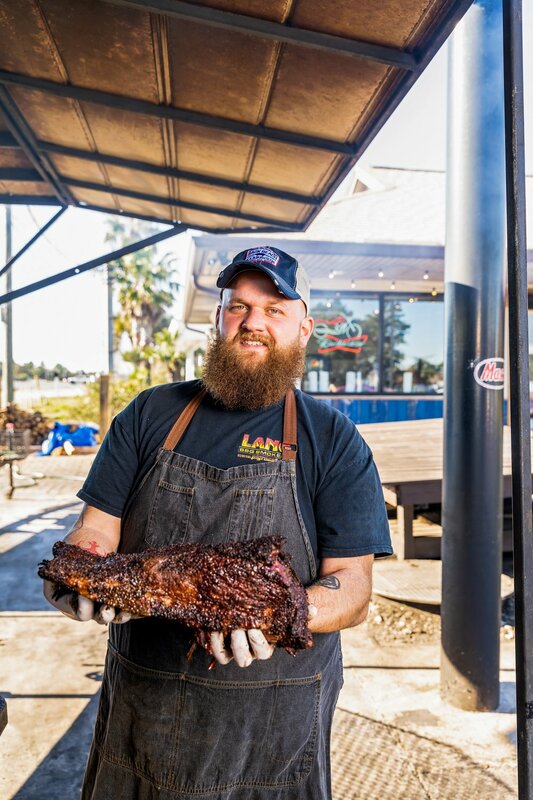 GG: What sets Back Beach Barbecue apart from other barbecue concepts in Panama City Beach? “When we came back from Austin, I didn't know what smokers to use. I did a lot of research and I came across the line of Lang BBQ Smokers out of Nahunta, Georgia. Ben Lang is the coolest guy. He doesn’t even call them smokers; he calls them cookers. We have three of his smokers out in front and everything gets cooked on them except for coleslaw, potato salad, and collard greens. Even the mac and cheese—we take the blocks of Velveeta and we smoke them until they turn into a gooey mess and we make a sauce with it. “The thing I'm probably the most proud of is that the cookers are true stick-burning. There’s no gas. A lot of barbecue restaurants do really good barbecue and there's wood in their cookers, but there's a gas emission that controls the temperature. With ours you never know what you're gonna get when you try to light it. Sometimes it’s not that easy with the elements. GG: Back Beach Barbecue is a restaurant, a food truck, and a catering company. How do you balance all three? GG: What aspect of being a restaurateur do you love the most? “At this stage, creating that personal touch to take care of the guest. Restaurant Paradis is a gift. Monica and I are so blessed. The riches you get from having a close-knit staff are amazing. If you read the reviews in-depth, like an owner would, guests talk about the attention to detail. At 5 o’clock the show goes on. I’m proud—super proud—of what the staff does. They’re more like a family, and family is the most important thing.